We went through many revisions to get to a plan that that both met our budget and our needs. Be wary aspiring home builder. All the pains you’re warned of carry truth. After running out of money to pay architects to help us design our house, we took matters into our own hands. We started asking lots of whys and why nots. We amassed a fair amount of knowledge being led through the process with Johnsen Schmaling Architects and added to that with lots of research and pesky calls to suppliers. Each round of drawings we made were submitted to our contractor at Beechwood Building and he pulled together numbers for us. Every configuration of a house has the potential to appraise differently. For example, we were going to have our studio separate from the house, but almost none of the structure counts towards the appraisal, thus more cash is necessary again. Months disappeared throughout this process. 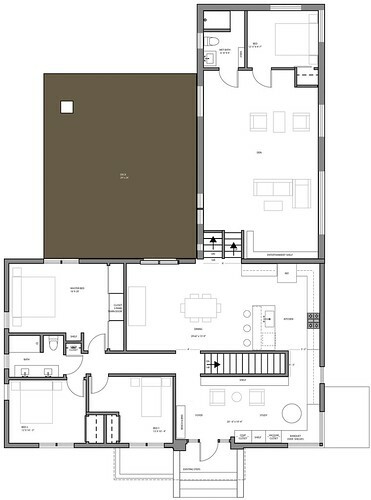 We minimized all changes to the existing house’s floor plan with the exception of the stairs and removing the roof. 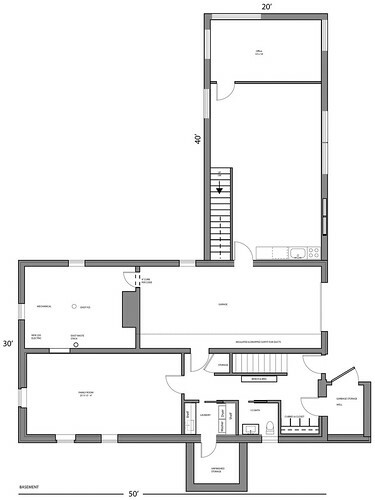 Tagged ann arbor, annarbor, Architecture, blue print, blueprint, debord, diy, floor plan, floorplan, home, house, michigan, residence, residential. Bookmark the permalink.